One of the first steps taken in the construction of the Second Temple was a massive earth-moving operation. God instructed His prophets that the Temple should be built on Mount Moriah in Jerusalem and the section of this mountain occupied by the Temple is known as the Temple Mount. It measured 500 cubits by 500 cubits (a cubit measures approximately 18 inches, so the Temple Mount measured 750 feet on each side) and before construction of the Second Temple could begin it had to be completely excavated all the way down to solid bedrock to clear the site from any possible trace of human remains which might have been there. The builders of the Temple were particularly sensitive to any type of ritual contamination which might impinge upon the sanctity of the Temple and the Kohanim [priests] working there and so took pains to ensure that no such contamination was present. Since, according to Jewish law, tumah [ritual contamination] from even a small fragment of human remains has the power to pass through the solid ground above it all the way to the heavens it would have rendered anyone standing on the ground above the grave tamei[ritually contaminated]. Clearing the site of all the dirt effectively ensured that no trace of human remains was present and this made the site tahor [ritually pure]. 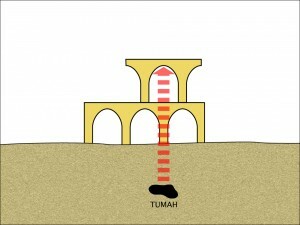 A two-level network of arches was built over the bedrock which further protected against possible tumah. 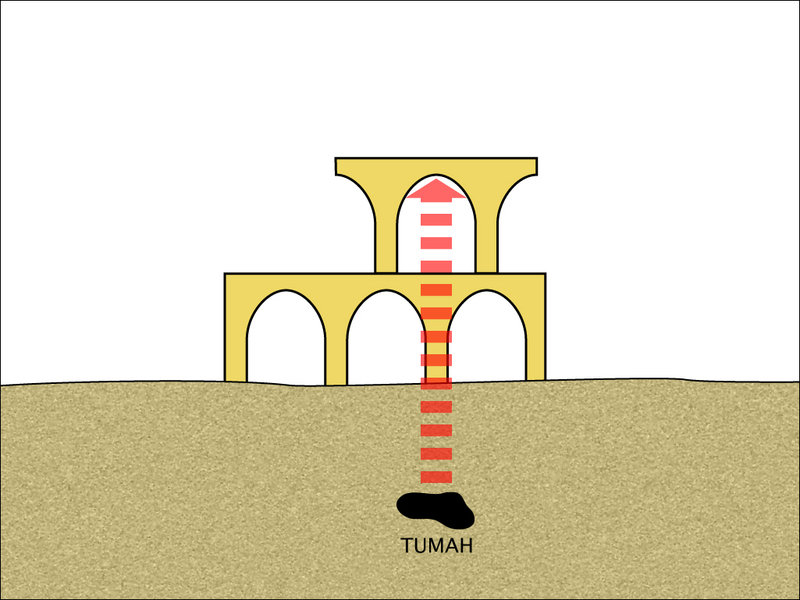 Jewish law teaches that the tumah of a grave is prevented from rising further when it encounters a covered airspace of one handbreadth (approximately 3 inches), thus an arch will protect the ground above it from such tumah. One level of arches would not have been sufficient since any tumah directly under one of the solid support columns would continue to rise. Therefore, a second level was needed with support columns placed over the airspaces of the first level. 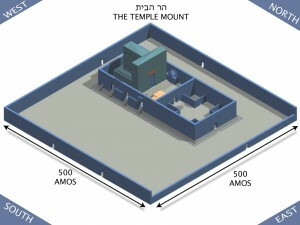 Although, according to the letter of the law, the excavations alone rendered the entire area of the Temple Mount tahor, it was nonetheless felt that for the sake of the Holy Temple an additional precaution of the double arches should be employed to rule out the extremely remote possibility of an unknown grave within the bedrock itself. Having excavated down to the bedrock and installed the arches, the Temple could have been built on the now-level plane directly atop the arches. Instead, the elevations of the various courtyards matched the original – and Divinely fashioned – contours of Mount Moriah prior to the excavations, increasing in elevation as one moved from east to west within the Temple. Rather than regaining the original elevations by back-filling the area over the arches with fresh dirt, a system of vaulted tunnels was constructed under the entire Temple complex. The lowest level of tunnels supported the floor of the Temple Mount; above this was another level, 6 cubits high, which supported the area under the Women’s Courtyard; a third level, 7Â½ cubits high, supported the floor of the Main Courtyard. For more information on this topic, and to submit questions or comments for the author, please visit the blog post of this class.